So, we are very pleased to have this project taken care of. 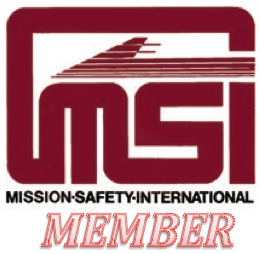 We are thankful for MMS Aviation in ordering the parts and those involved in transporting them. We don't have a large parts stock, so getting parts in a timely manner can sometimes be a big challenge. AFFS FLIGHT TRACKING SYSTEM INSTALLED: An essential safety aspect for our work is the ability to know where are aircraft is during all stages of the flight. Of course, the pilot might like to know that (har har), but other teammates might have an urgent message to get to him or the situation at the destination may have dramatically changed. 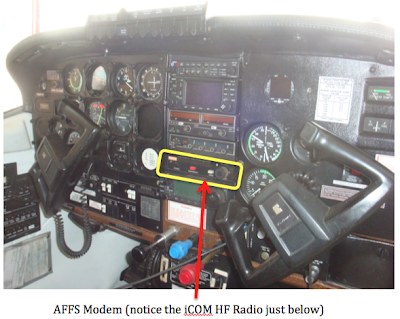 "The AFFS flight tracking modem interfaces to the already installed ICOM HF radio and the Garmin GNS 430 radio. The modem takes the current position as well as route & time information from the GPS, encodes it and sends it by HF to a base station. We are using the base station at SIL Aviation in Yaoundé for now. It reports automatically every 5 minutes and is quite reliable. It worked well even on the ground in Lebamba (Bongolo Hospital's airstrip in the far south of Gabon). This is a real boost for us in terms of flight tracking." STRUT STEPS INSTALLED: Adding steps to the side of the fuselage and wing struts on both sides allows for better access to the fuel tank filler holes. 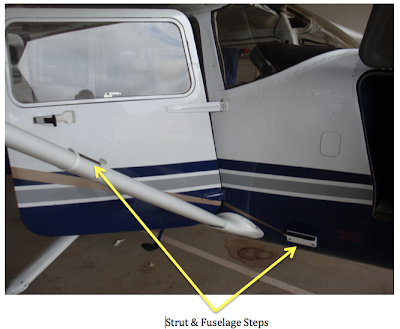 Rob also calibrated a new fuel tank dipstick and, as he states, "Dennis F. (SIL- Yaounde Aviation Manager) also helped me with painting the steps and strut steps and Dan was able to install them. I used them on my flight back to Bongolo last weekend to add 8 gallons of fuel by jerry can." VISUAL CHECK LIST INSTALLED: If you had a good eye, you may have noticed another addition to the cockpit. We have added the visual checklist tabs to the top of the instrument panel to be exactly like every other JAARS fleet aircraft. Essentially, this is a row of flip tabs that allows the pilot to systematically flip them up or down to signify completion of a particular part of the checklist. They are used on both takeoff and landing. 1. Fuel flow monitoring upgrade: There is an "add-on" to our JPI engine monitoring equipment that allows us to also monitor fuel flow. This will be a great safety factor as well as enhancement so that we can operate the engine "lean of peak", saving us about $75 per flight hour! There are some expenses involved (approx. $650), but we have been blessed by a friend of the program who has donated $450 to this item as well as another $50 donation from another donor! 2. Pitot-Static bi-annual check: Our transponder needs to get to an approved facility to get a check up. The closest one for us will be in Nairobi, Kenya. So, before the current certification expires in October, Rob will most likely pull the unit from the aircraft and take a commercial flight to Kenya to get this done. It will be an expensive endeavor, but one we can't avoid. Would you like to assist in the financial needs for this trip? We estimate a total need of about $1500. To make a donation to the airplane, go to: https://secure.cmalliance.org/give/ and enter "Gabon Airplane" in the space provided under the heading "Give to Int'l Workers and Special Projects". More updates from the flight deck to follow!